French philosopher Rene Descartes famously wrote, “I think, therefore I am.” Thoughts occur naturally and automatically and they define who you are and how you behave. As I’ve mentioned in previous articles, what you think affects how you feel, and how you feel affects how you behave. But, how true are your thoughts to be guiding your actions? If you think it, does that mean it is true? Often times this is difficult to distinguish. Your thoughts tend to be based in the past or the future, rarely present in the moment. 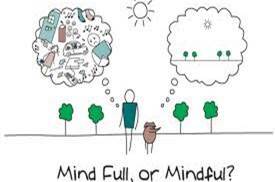 Hence my initial question: is your mind full or are you mindful? When thoughts are rooted in the past, they are usually fear-based. What is the fear? It is that whatever transpired with a negative outcome in the past will inevitably happen again in the future. Usually that fear is accompanied with feeling a loss of control. To help alleviate your fear, let’s define it. FEAR = False Expectations Appearing Real. Namely, just because it occurred in the past does not mean it will again. Your thoughts are conjuring up false expectations. When thoughts are consumed with worry over the future, guess what? Your mind is planning for a negative outcome. Worry tells your mind that all will not be okay so you feel anxious and act accordingly. These negative narratives you tell yourself are usually worse than the potential reality thereby causing you great, unnecessary distress. So what can you do about it? Instead of having your mind full of thoughts that cause you distress, become present to the moment and be mindful. By being mindful you can develop a way to deal with uncomfortable thoughts that lead to painful feelings and regretful actions. Mindfulness helps you observe without judgment, accept, and develop skills to nurture your awareness of all that surrounds you in the present. Develop an Attitude of Gratitude: Learn to be grateful for what you have, discarding thoughts of what you don’t. To do this, try listing three things for which you are grateful every day. Put it in writing and re-read it weekly. Try practicing meditation and/or yoga: All day, every day, your mind wanders. By practicing meditation and/or yoga you allow your thoughts to wander without judgment yet learn how to rein them back to the moment by focusing on the breath. Do one thing at a time: Do you feel as if to make yourself worthy, it is necessary to multitask and “get it all done” right now? You’re not alone. However, this is what causes a mind to be full. To be mindful, try doing one thing at a time and give it your complete attention. See if you notice anything different. The mind is always searching for something more. For your wellness, breathing awareness to your life in the present is all you really need.